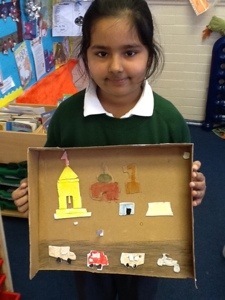 This week we were asked to be creative and show off everything that we know about Indian cities and villages. 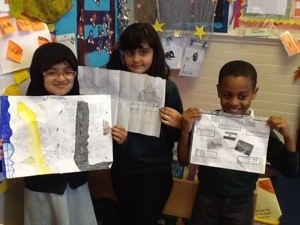 We could choose how we wanted to display our learning, some of our class made 3d models, created a power point presentation and even designed a poster. 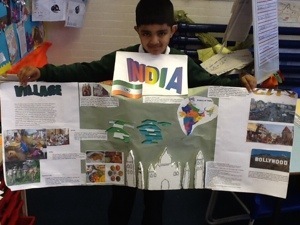 Have a look at some of our work and tell us what you think. Today in science we were learning about pollination and fertilisation. 1 – insects are attracted by bright flowers. 2- insects land on the flower and the pollen gets stuck to their body. 3- the insect flies away and the pollen gets stuck to another plant. 4 – the pollen sticks to the the stigma. 5- the pollen moves down the style. 6 – the pollen joins with the eggs in the ovary and produces new seeds. We have grown a lot over the Easter holidays. Yesterday we took apart a Lilly flower so that we could name the parts.